Sonic Unleashed (known as Sonic World Adventure in Japan) is a video game and the 11th installment in the Sonic the Hedgehog series developed by Sonic Team and published by Sega for multiple platforms in 2008. The game follows Sonic the Hedgehog as he attempts to restore the world to normal after his nemesis, Doctor Eggman, splits the world into pieces, as well as his struggles with his new beast form, Sonic the Werehog. Gameplay features two distinct styles, with each being played either during daytime or night-time. Daytime stages incorporate Sonic's traditional platforming and trademark speed, with a combination of behind-the-back third-person viewpoints and 2D side-scroller platforming; gameplay seamlessly transitions between these two views. Night-time levels see Sonic transform into the Werehog; gameplay slows down to accommodate greater platform play, and involves combat against waves of enemies using the Werehog's brute strength. The game's existence was first brought to light when Sega trademarked the Unleashed name, and shortly after, images and a gameplay video were leaked to the public in March 2008. Public anticipation for the game was high, owing to the video's demonstration of some two-dimensional gameplay, seen as a possible return to Sonic's platforming roots. However, critical reception for the game was mixed, with reviewers praising certain elements, such as the sense of speed in daylight stages and the graphics and audio that make up the environments, and criticizing others, such as the new Werehog game mechanic, as well as several gameplay and design concepts. Many reviewers felt that Unleashed was ultimately not the title that would be able to reinvigorate the series. Sonic Unleashed was de-listed in 2010, following Sega's decision to remove all Sonic titles with average Metacritic scores from sale in stores. Third person gameplay in Apotos (Ps3/Xbox 360 version). Gameplay in Sonic Unleashed focuses on two modes of platforming play: fast-paced levels that take place during daytime, showcasing Sonic's trademark speed as seen in previous games in the series, and slower, night-time levels, during which Sonic's Werehog form emerges, and gameplay switches to an action-based, brawler style of play, in which Sonic battles Gaia enemies (those created by the main enemy in the game, Dark Gaia). Each level takes place on a particular continent, each of which have been modelled on real-world locations (i.e., Greece is 'Apotos', Europe is 'Spagonia', Africa is 'Mazuri', North America is 'Empire City', Asia is 'Chun-nan', Antarctica is 'Holoska', Middle East is 'Shamar', Eggmanland is a pun on England and Southeast Asia is 'Adabat'). In sections of the PlayStation 3 and Xbox 360 versions of the game, the player may choose to advance the time of day in order to play as either Sonic or the Werehog; in the PlayStation 2 and Wii versions, time is advanced automatically. Daytime levels focus on Sonic's speed, and to this extent, sees the player control Sonic through fast-moving stages containing both 2D and 3D styles of gameplay. 2D sections are reminiscent of the Mega Drive/Genesis-era Sonic games, where the player controls Sonic in a side-scrolling fashion, while 3D sections sees the camera placed behind Sonic, so the player may move in all directions. In addition to moves available in past games, such as wall jumping and the homing attack, new moves are also introduced. For instance, a new side-step feature is available known as the Quick Step, allowing Sonic to dodge left-and-right, and a Speed Drift feature allows Sonic to turn around corners at high speed, without slowing down. The game also affords a gameplay mechanic for speed used in the Sonic Rush series in the form of Sonic Boost, which temporarily increases Sonic's speed, as well as allowing him to smash through objects, destroy enemies instantly, or even access different level paths. In the PlayStation 3 and Xbox 360 versions, an on-screen "Ring Energy" meter is used to display how much boost is available. The amount of boost remaining may be increased by collecting more rings, and is decreased when the player uses it. In contrast, the PlayStation 2 and Wii versions of the game, available boost is represented by bars, which may be increased by performing "Action Chains", destroying multiple enemies in quick succession through the use of homing attacks or by collecting rings. The night-time levels feature slower, action-oriented gameplay, in which Sonic transforms into the Werehog, a beast form that has great strength and stretchable arms. Gameplay here sees the player use a variety of melee and combo attacks to defeat a large number of enemies, collect items and move items around to advance through the level, and use his stretchable arms to cling to distant objects; simple puzzle elements are also featured. Collecting rings in these segments replenishes the Werehog's health, while a special move, Unleashed Mode, allows the Werehog to channel his anger into increasing the power of his attacks for a short time. Night-time levels have been adjusted in the Wii version to allow greater use of the Wii Remote, where players may control the arms of the Werehog by using the Wii Remote and Nunchuck in order to grab onto objects and move forward in the levels. The Wii version of the game also expands upon the ratio of night-time levels to daytime, with more than three times as many night-time levels (twenty-five in all). After night-time levels are completed, Dark Gaia Points are gained, allowing access to bonus moves. In addition to these two gameplay types, Sonic Unleashed also features hub-worlds, in which the player may find out about information, as well as advance the story of the game. 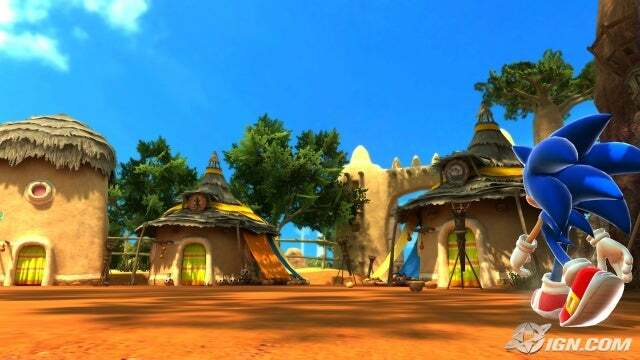 Hub-worlds operate differently depending on the version of the game being played; the PlayStation 3 and Xbox 360 versions feature fully-interactive, explorable 3D hub-worlds, where townspeople may be interacted with and sidequests may be undertaken, in order to gain experience or unlock items, such as artwork, videos and music tracks. In contrast, the Wii and PlayStation 2 version features a menu-based map system, where players simply click the appropriate area to talk to the townspeople and find information. Within both day and night-time levels are medals that Sonic may collect, two types of which exist: Sun and Moon. In the PlayStation 3 and Xbox 360 versions, collecting these medals allows the player to level up Sonic's Sun and Moon stats, and these must be increased to reach new stages in the game, with a certain number of Sun medals for Hedgehog levels, and a certain number of Moon medals for Werehog levels. Because only the PlayStation 3 and Xbox 360 versions feature playable hub-worlds, this is also the only version in which Sun and Moon medals may be found by exploring the towns, talking to the citizens, and completing side-quests. Sonic as he appears in his Werehog form for the first time. uffer amnesia. Assuming he has caused it with his fall, Sonic decides to assist him in his quest to find out who he is, and the creature becomes a guide for the player; Sonic soon gives him the nickname Chip. Sonic's quest begins, and with the help of some old friends, such as Amy and Tails, he attempts to solve the crisis by traveling the world's continents, finding shrines that will fix the Emeralds, in order to return the world, and himself, to normal. After six of the seven continents are returned to normal, Chip is able to regain his memory; he is in fact Dark Gaia's opposite, Light Gaia. For millions of years, the two of them had been in a cycle since the beginning of time where Dark Gaia would break the planet apart, and Light Gaia would put it back together. Chip was released along with Dark Gaia, but because both of them were released prematurely, he lost his memory, and Dark Gaia was broken apart. They are able to place the last Chaos Emerald in the shrine on the final continent at Eggman's new empire, "Eggmanland", but are interrupted by him; Eggman orders a now-whole Dark Gaia to destroy Sonic, but it turns on him, and reabsorbs the power that turned Sonic into a Werehog, curing Sonic of the lycanthropy. Chip calls all of the Gaia temples together and forms the Gaia Colossus, and begins to fight Dark Gaia. Dark Gaia is not finished with them or the Earth yet, and consumes the entire world in darkness, becoming Perfect Dark Gaia in the process. Chip then gives the restored Chaos Emeralds to Sonic, allowing him to turn into Super Sonic and defeat it; Dark Gaia then sinks back into the planet, but the battle takes its toll on Super Sonic. Chip saves an exhausted Sonic by throwing him to the surface, before returning himself to the inside of the planet; he leaves behind his necklace and some parting words, and Sonic places the necklace on his hand as a bracelet to remind him of their adventure together. The game ends as Sonic speeds off with Tails, who flies alongside him on the coastline in the Tornado plane, the duo heading off for yet another new adventure, which would be Sonic Colors. Sonic walking through Mazuri's hub world. Sonic Team began development of the game in 2006, after having begun work on the core technology, the Hedgehog Engine, in 2005. The title was first brought to public attention when the Sonic Unleashed name was trademarked by Sega on March 12, 2008. Screenshots of cut scenes, artwork, and a video were leaked ten days later, with the title then officially confirmed by Sega on April 3, 2008 with a small selection of screenshots and an updated video. The game was developed internally by Sonic Team in Japan. It was originally intended to be the third installment of the Sonic Adventure series and subsequently, at an early development stage, had the working title Sonic World Adventure, complete with work-in-progress logo. However, the development team began to introduce enough new innovations to separate it from the Sonic Adventure titles, and so a new title, Sonic Unleashed, was decided upon. It was then later revealed that the game's name in Japan would in fact remain Sonic World Adventure for its release there. Sonic Team decided early on in the development process to reduce the number of characters present in the game, as well as to make Sonic the only playable character; this decision was taken to get more quality out of fewer characters. While it felt that these ideas combined with traditional Sonic gameplay was a good beginning, it also had to consider how to introduce newer gamers unfamiliar with the Sonic franchise to the series, and so the concept of the Werehog was born. Director Yoshihisa Hashimoto felt from the outset that there would be both praise and criticism, but hoped that long-term Sonic fans would understand and empathise with the ideas and direction the team had taken. In terms of technology, Hashimoto remarked that the visual style was born out of desire to see a global illumination solution used for the game's lighting — that is, light reflecting from one object in the scene onto others. To this extent, development on the renderer for this process began, and the final solution allowed the developers to use distributed rendering over hundreds of computers to calculate lighting for each ten- to twenty-kilometer action stage in around two or three days. Characters, enemies and objects are then lit at run-time with Sonic Team's "Light Field" technology to blend them in with the surrounding pre-calculated lighting. Because the game was being developed for two levels of hardware capability depending on the target platform, two development "silos" were set up to work on two separate builds of the game: one for the Xbox 360 and PlayStation 3 version utilizing the Hedgehog Engine, and one for the Wii and PlayStation 2 version, which instead utilizes a modified version of an existing, internal Sega engine. As well as the unique motion-based gameplay mechanics, the Wii version of the game also supports the GameCube controller, and also the option of using the Classic Controller. The daytime levels for the Wii were altered to accommodate the motion control-based drift mechanic, while night-time levels include a mostly behind-the-back view and different platforming styles and combat mechanics. Developer Dimps, who had past involvement in the Sonic franchise, was involved in the design of the daytime areas for these versions. In addition, overall, the Wii and PlayStation 2 versions have fewer daytime levels than the PlayStation 3 and Xbox 360 counterparts. Initially, it was stated that Unleashed was to be intended solely as a single-player experience, and would not offer any multiplayer or online modes. This was cast into doubt when references to online modes were alluded to around E3 2008, but later interviews re-iterated that Unleashed would have no online modes at all. However, downloadable content, including additional levels, would remain a possibility after the game's release. A demo version was released on the Xbox Live Marketplace on December 8, 2008 and on the US and EU PlayStation Stores on December 18 and 24, 2008, respectively. The demo does not contain any of the Werehog stages. On March 12, 2009 Sega released Sonic Unleashed's first downloadable content for the Xbox 360 and PlayStation 3, consisting of four Chun-nan daytime stages and two night stages in addition to two new missions. Since then, more downloadable levels have been added: Spagonia, Holoska, Mazuri, Apotos, Shamar, Empire city and Adabat. Speaking after the game's release, Sonic Team member and Sonic and the Black Knight director Tetsu Katano remarked that although he did not feel the Werehog concept was a mistake, time and resources were a limiting factor in the game's production. He also remarked that the Werehog may reappear in future games, or possibly in a sequel to Sonic Unleashed, should one be made. Game developer Gameloft announced in May 2009 that it had secured a licensing agreement with Sega Europe Ltd. to produce mobile phone versions of Sega properties, and that its first title would be a version of Sonic Unleashed for mobile phone platforms. It was released in June 2009 in Europe, Middle East, Australia and New Zealand. 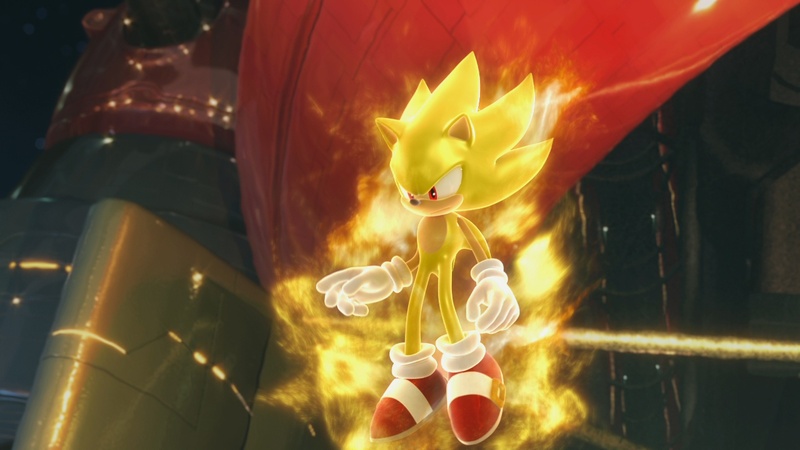 Super Sonic's appearance during the opening cut-scene. Initial anticipation when the first media for Unleashed was revealed was high, as the demonstration videos hinted at a possible return of Sonic to his traditional platforming roots, especially because of the series' declining quality in recent years, and a number of poorly received titles in the franchise that preceded it, such as the 2006 game, Sonic the Hedgehog. However, critical reception to Unleashed was mixed and average, with Metacritic aggregate scores of 54 and 60 out of 100 for the PlayStation 3 and Xbox 360 versions respectively, and 66 out of 100 for the Wii and PlayStation 2 versions. The added element of motion controls for the Werehog sections, as well as text-based hub worlds and better Werehog level design and camera system, were reasons cited for the higher review scores for the Wii version of the game, though a few review websites, such as 1UP, gave the Wii version a lower score than its 360 and PS3 counterparts. Nevertheless, the game was a commercial success and sold 2.45 million units combined making it Sega's third best selling game during their last fiscal year period of 2008. Positive elements of Sonic Unleashed remarked upon by reviews include the environments, such as the "postcard-perfect architecture", and the graphics, with stages looking "absolutely gorgeous" and being "very pretty and lovingly animated", with one reviewer comparing them to a playable Pixar film. Praise was given to the technical competence of Sega's new Hedgehog Engine as a whole on the Xbox 360 and PlayStation 3 versions, with "bright cartoonish graphics that fly by without a stutter"; however, some complaints were raised about frame rate reduction when large numbers of enemies appeared during the Werehog sections. Although the Wii and PlayStation 2 versions do not use the Hedgehog Engine, graphics for these platforms were still praised for their high quality, with the title being nominated for Best Graphics Technology for the Wii by IGN in its 2008 video game awards. The soundtrack to the game was also praised as being an improvement on more recent installments in the series; use of an orchestral score, rather than rock as in more recent games, was appreciated. An overwhelmingly negative reaction was given by critics to the Werehog concept and corresponding night-time sections, which contributed greatly to the lower than expected review scores. Some reviewers compared the Werehog sections to God of War. Complaints stemmed from the game's change of speed, from high-speed daytime sections to the slower, night-time sections; the "pace-breaking combat levels" were described as "plodding", as well as "lethargic" and "combat-heavy". Further to the change of pace, the new style of gameplay that accompanies the night-time levels was widely criticized, involving "frustrating" platform elements and combat described as not "terribly interesting" and "boring", with "awkward" action sequences overall. Some reviewers felt that the Werehog as a concept did not mix well with the daylight areas and traditional Sonic gameplay; GamePro's review described them as "dreadfully out-of-place", while IGN stated that they have "nothing to do with Sonic whatsoever", feeling that the Werehog was "being slapped on" to the Sonic experience. In stark contrast to the Werehog sections, many reviewers found the daytime levels to be enjoyable, especially the "exhilarating" sense of speed they provide; with "the most satisfying gameplay of any Sonic title in years", the game "perfectly [captures] the feel of classic Sonic". Many also enjoyed the mixture of, and transition between, 2D and 3D sections. Indeed, many reviewers remarked that they would have appreciated the game more had it comprised solely of, and expanded upon, the daytime levels. GameSpot's review for the Xbox 360 version however argued that the controls were "unresponsive" in the daytime levels, and that most of them were "horribly designed", instead describing the Wii version as a "vastly superior experience", with its daytime levels praised for better control and design. Aside from the criticism of Werehog levels, further aspects of the game were criticised, contributing to the mixed review scores. The quests that players must undertake in hub-towns were described as "inane" and "tedious", where "figuring out what happens next involves aimlessly wandering through towns and speaking to citizens, only to discover that most of them don't know what we're looking for". The story and overall tone of the game, including the new character Chip, were criticised, some remarking that it was too juvenile, or comparable to that of a Saturday morning cartoon. Most reviewers also felt that the English voice acting was poor. I do believe that Sonic Unleashed was a great game. It was the start where the series started to give Sonic's good name back. It is definitely one of my favorites of the series. Here you may feel free to discuss about Sonic Unleashed. This is a well-written review. Sure, there were a few typos, but those can be fixed. Daniel the Hedgehog wrote: This is a well-written review. Sure, there were a few typos, but those can be fixed. All of these reviews are from Wikipedia. It'd be hard for myself to make such a review that fast. I only have the Wii version but still enjoy the game. I love the part at the end where Dark Gaia comes out and you see how big it is compared to Sonic. Trespasser wrote: I love the part at the end where Dark Gaia comes out and you see how big it is compared to Sonic. Dark Gaia's model in the Wii Version doesn't look intimating at all. But the idea of it gave the story a good mix. Don't have a 360 so I didn't experience the great graffics. The only problem I have with the Wii is the control for Sonic and the Werehog. Mainly just Sonic with turning and having a hard time sometimes to control the boost. But drifting while using the boost makes up for that. It looks like a good game, but I couldn't care less about the graphics. As long as they're good enough that you can tell where you are and where your enemies are, the graphics are good enough for me. However, it's still just another game I will never have. Star might end up having it if he begs enough, but not me. My dad and I couldn't care less about new consoles that cost enough to buy a new custom-built Ferrari. We just stick to computers and consoles that went obsolete over eight years ago. Daniel the Hedgehog wrote: It looks like a good game, but I couldn't care less about the graphics. As long as they're good enough that you can tell where you are and where your enemies are, the graphics are good enough for me. However, it's still just another game I will never have. Star might end up having it if he begs enough, but not me. My dad and I couldn't care less about new consoles that cost enough to buy a new custom-built Ferrari. We just stick to computers and consoles that went obsolete over eight years ago. Like the Dreamcast! But yeah you do have a point. Other than the control I didn't have much of any problems with the game. I really enjoyed the game play on this one but if it was me i'd have made it sonic and knuckles and done away with the stretchy arms. Sonic for the runny and Knux for the punchy and wee! But I guess I'm in the minority because I actually liked the story line of adventure and the like even if the game play needed some refinement. I wasn't happy with the kind of story telling, the static pictures and the 'talk' to people but not really and no exploring. I really like free exploration of the world.. just my thing I guess. Happyskunk wrote: I really enjoyed the game play on this one but if it was me i'd have made it sonic and knuckles and done away with the stretchy arms. That's what the 360 and PS3 did a bit with a free roam in the different places but some people found it annoying. I wouldn't mind if they created some sort of free roam of the world game for Sonic but that's just me. It would in a way but Sonic's gameplay overall through the years hasn't been free roam except for Sonic Adventure, Sonic 06, And Sonic Unleashed. But you get what I mean. The fan boys would be happy if it had Classic Sonic and the Classic graphics. But I've heard rumors that SEGA might decide to make separate games for both Classic and Modern to keep making fans happy and have variety. And nice. I've wondered at times what my character would like as a 3D model. hehe well i'm still teaching myself how to do it, would you mind if i made your char to help me practice? Happyskunk wrote: hehe well i'm still teaching myself how to do it, would you mind if i made your char to help me practice? By all means, I wouldn't mind. Here's a link for a picture of him. sweet thanks. This should be intersting. alrighty well the white parts, are those shoulder spikes on his jacket? or something else? i'll do some sketches so i make sure to get him right. Sound good? Happyskunk wrote: sweet thanks. This should be intersting. Its the collar of his jacket and sounds good. Werehogs were the worst invention of the series. IN fact, this game made no sense to me. That being said, the gameplay was unique in the series and the werehog is the sexiest thing ever. Yeah, the whole Werehog idea was the downfall for this game. Here could of been the solution that would of gotten better reviews for the game overall. Simply switch the Werehog with Knuckles. It'd be cool to see Knuckles using that kind of combat style. I know the game's just about Sonic but it would of been a better choice for SEGA and Sonic Team. It would of been better to execute at least. Thinking outside of Snake's box can do you wonders.